Which is Best... Fast or Slow Juicers? Let's get a few terms under our belt first. High speed juicers are also referred to as "centrifugal" juicers and slow juicers are sometimes called "masticating" or "cold press" juicers. Which design is best? That depends on what's most important to you; the comparison below should help you decide. 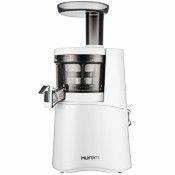 Centrifugal juicers shred ingredients with a serrated disk and extract juice by spinning the processed food at a high speed (3,000-12,000 RPM) that forces the juice out through the juicer's screen/strainer. 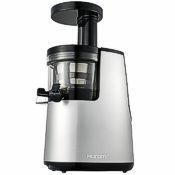 High speed juicers can handle larger pieces of produce than slow juicers can, which means less chopping is required before running your ingredients through the juicer. As its name implies, high speed juicers process ingredients quickly, which means you can make a lot of fresh juice in no time! Leafy greens and berries can't be juiced very well with centrifugal juicers, and nearly the whole food will go into the pulp container, instead of producing the juice you want. Masticating juicers gently squeeze or "chew" ingredients to achieve the highest possible juice yield and most nutritious juice. Pressing juice from food is slower than forcing juice from shredded food using centrifugal force. Masticating juicers range in RPM speeds from around 40 to 120.Juice extracted from masticating juicers is cooler than juice from centrifugal juicers, but it's a common misconception that centrifugal juicers produce enough heat to denature enzymes. The difference in juice temperature between the two styles of juicers is minimal. Slow juicers break down plant fibers more thoroughly than centrifugal juicers can, so more of the phytonutrients, vitamins, and enzymes are extracted, resulting in a more nutritious juice. 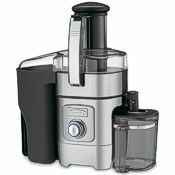 Masticating juicers can press anything from hard vegetables and fruits to soft berries, leafy greens, cruciferous plants, and soaked nuts and soybeans! Time: Centrifugal juicers offer time-saving benefits over masticating juicers because their chutes are larger, allowing you to process larger foods, and they process ingredients faster because they operate at much higher RPMs.Yield: Both designs produce comparable yields from hard foods such as beets and carrots, but when it comes to leafy greens and soft fruits like berries, masticating juicers produce much more juice.Oxidation: We've all seen a sliced apple turn brown because it's exposed to oxygen, but did you know oxidation happens with fresh juice too, especially when the juice was made in a centrifugal juicer? Shredding or chopping fruits and vegetables exposes the plant cells to more oxygen than simply pressing the produce does. Not only does oxidation turn your juice an unappetizing color, but it deteriorates the antioxidants including vitamins A, E and C. It's always best to drink fresh juice immediately, but if you have leftover juice, it keeps well for 24 hours if made with a centrifugal juicer and 72 hours if made with a masticating juicer.Nutrition: Masticating juicers give you more nutrients from your raw foods than centrifugal juicers, which means slow juicers also extract dramatically more value from your food dollar. The more you use your slow juicer, the more nutrition you get—and the more money you save. 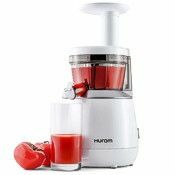 It's a win, win!Noise level: Masticating juicers are far quieter than centrifugal juicers, and Hurom slow juicers are nearly silent!Affordability: Fresh juice is becoming the go-to drink for many of us, but at over $8 a bottle, fresh juice is expensive. If you’re buying a bottle of juice more than twice a week, a juicer will pay for itself in short order! The table below lets you compare the features and key specs of our variety of juicers, and more details are available on individual product pages. If you have questions not answered here or would just like to discuss your particular needs, our knowledgeable customer service representatives would love to talk with you. Dimensions measured width x depth x height in inches.